Asian handicap betting is one of the most attractive and most popular form of football betting. This kind of betting became popular in Europe only in this century, but first appeared in Indonesia and that is why it is called ‘Asian’, the term first coined by a sports journalist in 1998. The word ‘handicap’ appeared long ago, when there were no bookmakers and players threw papers with their stakes in a cap before the start of the game, hence the ‘hand-in-the-cap’. 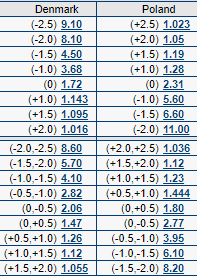 The basic principle of the Asian handicap is that you do not have to place only a straight 1X2 bet. If you want to bet on a favourite, odds of this outcome can be small and you simply won’t be interested in such stake. In this case, you can bet on a favourite with a negative handicap at a higher price, suggesting that your team will win by more than one goal. At the same time, you can bet on an underdog and even if your team loses, you will still win money. For example, you think that an underdog will lose, but only with a small goal difference, you must make the bet with a positive handicap. Indeed, the Asian handicap is not a stake on the outcome but on a goal difference. That is why Asian handicap betting is very popular among European punters. In order to have a better understanding why the Asian handicap is the most ‘elastic’ form of betting and gives you more options let us consider a real example. For instance, you analyse the match France vs Netherlands (there are real betting lines of one bookmaker in the picture). After analysing this game, you can draw the following conclusion: the probability that the French will win this game is high, but it is less than the total probability that the Dutch will win, the match will end in a draw or the Dutch will lose by more than one goal. Following your train of thought on this matter: maybe the French will win, but Netherlands certainly won’t lose by more than one goal! If your betting site offers only 1X2 markets, it will be difficult for you to make a choice - you will not risk betting on away win, but you will not be interested in the home win at such price. So, what to do? A betting site that offers an Asian handicap will help you! 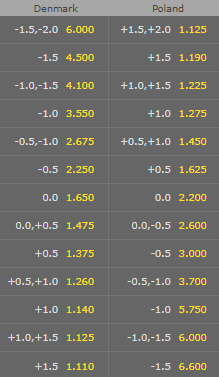 As you can see in the picture, you can bet on Netherlands to win match with Asian handicap (+1.5) at @1.51. This means that you will win money if the guests win, if this game ends in a draw or if the hosts win by one goal. Well, you must admit that Asian handicaps give you freedom of choice! Asian handicaps reduce a possible number of outcomes from three to two and you can win, lose or return amount of stake (it is called 'push'). It is all depending on the type of Asian handicap. There are three main types of handicap lines: Full goal (-1; 0; +1), Half goal (-1.5; +1.5) and Quarter goal (-1.25; +1.25). Therefore, to find out whether your bet has won all you need is to add a handicap to a real number of goals. Where Asian handicap (0) is awarded, a drawn game will return your stakes, and you will win if your team wins. Actually, such representation communicates general idea of Asian handicaps, because if you bet with a handicap (-0.75) this means that half of your stake is placed on (-0.5) and the other half on (-1). Well, yes, Asian handicaps can be confusing for many people but in fact, it is not as difficult as it seems! Let us analyse each type of bet by the example. Suppose that the match has finished 2:1. If you backed Chelsea to win with a handicap of (-1.00), you would have got your money back. Add the handicap to the result of 2:1 that gives you the score of 1:1 (draw), so it’s ‘push’. If you backed Arsenal to win with a handicap of (+ 1.00), you would also get your money back. Add the handicap to the result of 2:1 that gives the score of 2:2 (draw), so it’s ‘push’. Suppose that the match has finished 3:1. If you backed Chelsea to win with a handicap of (-1.00), you would have won. Add the handicap to the result of 3:1 that gives you the score of 2:1, so it is a home win. If you backed Arsenal with a handicap of (+ 1.00), you would have lost. Add the handicap to the result of 3:1, so the result of the game will be 3:2 and your bet on Arsenal will lose. Of course, if Arsenal won or drew this game, a negative handicap would have lost and a positive handicap would have won. If you backed ‘Draw No Bet’ and the game ended in a draw, you would have got your money back. If a team with the handicap (0) won - you would have won too; if your team lost, you would have lost your money too. Suppose that the match has finished 2:1. If you backed Chelsea to win with a handicap of (-1.50), you would have lost. Add the handicap to the result of 2:1 that gives the score of -0.5:1. The guests had ‘more goals’, so the hosts had lost. If you backed Arsenal to win with a handicap of (+ 1.50), you would have won. Add the handicap to the result of 2:1 that gives the score of 2:2.5. Suppose that the match finished 3:1. If you backed Chelsea to win with a handicap of (-1.50), you would have won. Add the handicap to the result of 3:1 that gives the score of 1.5:1, so it is a home win. If you backed Arsenal to win the match with a handicap of (+1.50) you would have lost. 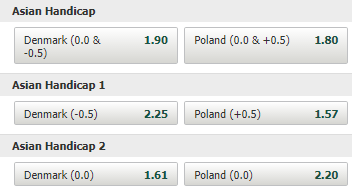 Add the handicap to the result of 3:1, so the result of the game will be 3:2.5. The Gunners had 1/2 of a goal less, so they had lost. Quarter goal Asian handicap is the most difficult to understand for the beginners and here's where it gets interesting because this type of handicap has four possible outcomes - a win, loss, half win and half loss! It sounds somewhat crazy, but this is the best part! As we know, Asian handicap is like two bets rolled into one. For example, AH (-0.25) is actually a bet which is between of AH (0) and AH (-0.5). In other words, you make half of the stakes with a handicap of (0), and the other half with a handicap of (-0.5). So if the match finishes in a draw you will win half your bet with a handicap of (-0.5) and half your bet with a handicap of (0) will be refunded. Three quarter Asian handicap (+0.75) is split between AH (+0.5) and AH (+1). Let say, you backed €100 on Chelsea to win with a handicap of (+0.75) at @2.00. Of course, if they win or game ends in a draw, you will get €200 as any positive handicap always wins with such outcomes. However, if Chelsea loses the game by one goal, you will still get €50. Why? It's simple! Half your stake with AH (+0.5) is lost but the other half is returned with AH (+1). Don't worry if you still don't get it, below you can see the tables that present all possible outcomes of Asian handicaps from -2.5 to +2.5. Please believe us, Asian handicaps can be very profitable markets just for one reason – they are typically low margin offerings in comparison with such betting options like 1X2 or small markets. Thus, we come to the key question - what is the best betting site with Asian handicaps? Well, oddly enough, but there are not so many bookmakers offering Asian handicaps, as we would like to! First off, this betting site must meet two terms - a large selection of handicaps and competitive odds. 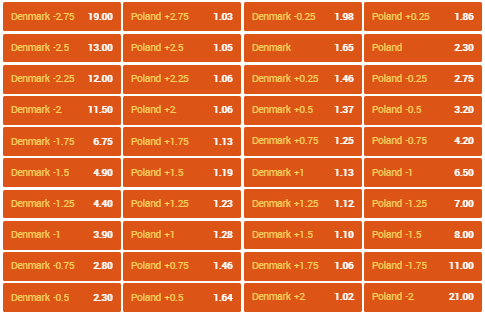 We can recommend the following betting sites, with which Asian handicap betting will be a good experience for you and will hopefully be a steady source of your income! You can see below the comparison of the Asian handicap betting lines of various bookmakers on the example of a real match. No one will argue that 888sport is a popular and well-known betting site, but surely, many will be surprised that this bookmaker is the second in our ranking. Nevertheless, this bookmaker offers the best selection of Asian handicaps in the world. There is no need to prove this fact - just look at the picture! Believe it or not, but no other betting site can offer a wider choice! If you think that 888sport has such a large selection of Asian handicaps only for the top games, you are wrong. You can count on 20 Asian handicaps with 0.25 steps for almost all football leagues! At the same time, the bookmaker offers one of the highest odds on the market, which is surprising in view of the fact that 888sport has average odds on the main markets. There are only Marathonbet and Pinnacle who can offer slightly higher odds. Given the odds quality and largest selection of Asian betting lines, we think that 888sport is the second choice for Asian handicap betting! Marathonbet remains in the shadow of big British bookmakers, but the clock is ticking and this betting site has gained a strong position on the market. The company has begun to win European customers quite recently. It uses powerful and effective marketing for their services, for example, Marathonbet is Manchester United sponsor. As for the choice of betting lines, quite a few bookmakers can be compared with this betting site! You can bet here on any sport or any league and find any type of bet. 100% guaranteed! That is why it is not surprising that Marathonbet offers some of the best Asian handicap lines. As you can see in the picture, for a typical football match, the bookmaker offers 17 handicaps with 0.25 steps. If 888sport offers the range of Asian handicaps from -2.75 to +2.75, then Marathonbet is worse only by 0.25, offering Asian handicaps from -2.50 to +2.50 and this is much more than you can expect from Bet365 betting lines! When it comes to odds quality, then only Pinnacle can compete with the Marathonbet. This bookie offers odds not just above the average, but some of the best! It is easy to calculate that they run a betting margin about 5%. This betting site can also boast the fastest payments in the market. It's no secret that Pinnacle is one of the best betting sites in the world, which offers the highest odds. Indeed, if we talk about the odds quality, then this bookmaker simply stands alone. However, Pinnacle is not the bookie for everyone and it's not that the company positions itself as a bookmaker for professionals. This betting site offers a very limited choice of events and sports. Besides, the range of betting markets is quite small here, for example, even for popular football matches you will not find such bet type like ‘Both Teams To Score’. Pinnacle can propose only the main markets - 1X2, Asian handicaps, game totals, team totals and the result of the first half. This betting site deserves the fourth place in our rating because of the best odds in the world (the overall betting margin is about 2%). As you can see in the picture, they offer only five handicaps with 0.25 steps. The thing is that Pinnacle never offers Asian line at small or huge odds, considering that professional players bet only at odds from 1.40 to 3.50, therefore there is no sense to offer a greater choice of handicaps! Nevertheless, if you like to bet on football and prefer the main markets, then Pinnacle is your choice! And do not forget, only here you can easily place €30,000 per bet and it will be accepted without any problems, and for such tournaments as World Cup or Champions League Pinnacle can set a limit €1.000.000 per bet! Titanbet is another betting site that offers Asian handicaps lines, but choices are limited. After all, if you prefer to bet on the main handicaps, then this bookmaker will satisfy you. Titanbet can guarantee odds above average and one of the biggest selections of events, so you can easily find any league or competition in any sport. You may be rather sure you will never get bored on this betting site, as Titanbet is the world's top specialist in bonuses and promotions! Despite the fact that Paddy Power is one of the most popular betting sites in the world and one of the largest bookmakers in Britain, this bookmaker offers a very poor choice of Asian handicaps lines. Nevertheless, we included this bookmaker in our rating for one simple reason that other leading European bookmakers do not offer Asian handicaps lines at all. On this betting site you will find only a few handicaps at high enough odds, but if you like never-ending promotions and bonuses, Paddy Power is definitely your best choice, it's not for nothing that Paddy Power is called ‘Home of the Money Back Specials’! No one bookmaker can be considered the best in the world, because each betting site has its advantages and disadvantages, and you need to choose the bookmaker depending on your betting manner, but if you want to choose a market leader, then it will be Bet365 without any doubt! When it comes to Asian handicap betting, Bet365 will be on the top again! First of all, this bookie offers the widest choice of sports events online, and you can be sure that you will find any game, regardless in which country or league it takes place! Unlike most British betting sites, Bet365 offers Asian betting lines and selection of Asian handicaps is really huge here! As you can see, you can bet on a football match with any handicap, the total number of which is 13 (for this certain game). The Asian handicaps go with 0.25 steps, creating great opportunities for your betting. Despite the fact that we gave the first place to this betting site, it is worth noting that Asian handicaps odds quality cannot be described as the best on the market. If Bet365 offers competitive odds on the main markets, then its Asian handicaps odds are about average. For example, you can bet on Denmark to win with a handicap of (-1) at @3.55 here, and 888sport priced this outcome at @3.90! At the same time, these bookmakers offer ‘Draw No Bet’ for the same price. Much depends on the league or tournament, for example, Bet365 can provide better odds for the English Premier League than their competitors. In any case, cumulatively, Bet365 remains the market leader.